Okay, so the Toyota trade did not work out. It was a low risk, little scalp for a few easy bucks. If you put the trade on and were stopped out, well then I’m sorry but them’s the breaks. You’ll notice a little lower in that article, however, that the coffee trade was a 100% nailed and there’s still room to run. Might have been luck. Only the trading gods know. Today though, I’m going to share what are by now two very obvious trades to the world of speculators. One is a short, and it’s move has already begun. The other is a long and the play is still setting up. First the short, it’s Delta Airlines (DAL) or rather airlines in general. Keep in mind this stock has become a hedge fund hotel along with American Airlines (AAL), which can be either a positive or a negative. On the one hand, the large institutional support can provide a ton of liquidity for any potential pyramiding of the professional positions. Additionally, shorts can be easily squeezed with the amounts of money that could potentially be thrown at the position. However, the short float is exceptionally low at under 2% so nobody seems to be expecting any sort of real selloffs despite the 12% down-move over the last 4 weeks. In other words, there’s not a lot of kindling for a hard short squeeze. The airline stocks have enjoyed a tremendous run. From the fall of 2012 to the spring of 2014, Delta was a 4-bagger. American has treated investors well for those that held the equity and the debt too as it worked its way through bankruptcy. The new ticker AAL, post-merger with US Airways, is already up around 100% since the beginning of the year. Allegiant, who I was very wrong about in a friendly argument with a colleague a couple years ago, has been a 3-bagger since the spring of 2012. Mr. S.P. off in Deutschland, you were very right and I was very wrong. I hope you rode the stock for maximum profits. The airlines have garnered a lot of momentum in what I think will ultimately be temporarily profitable situations. Unions have been re-bargained with. Fuel has been somewhat reasonable. And the fees for this, that, and the other have been a huge boon to the airlines’ income statements. Maybe the industry has entered the new normal along with developed world economies, and the airlines will all be immensely popular investment darlings. We can crown them as the core holdings in a new era Nifty Fifty alongside Tesla (TSLA), King Digital (KING), and Cynk Technology (CYNK), because if there’s one thing airlines are known for it is profitability. 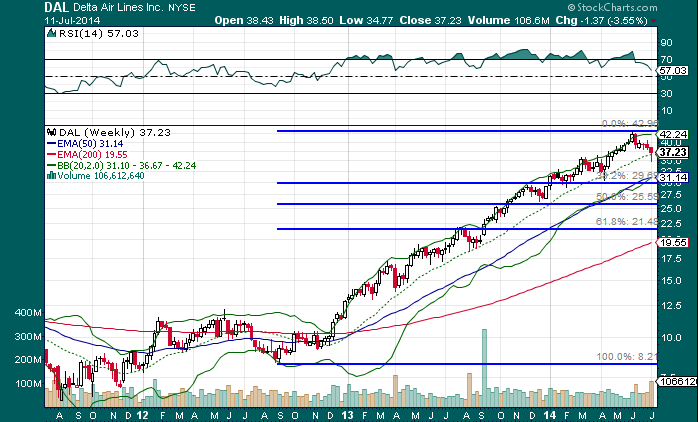 The 38.2% retracement target is essentially $30, so that makes for a reasonable 1st profit point on a short position. Winners have to be given room to run so you’ll have to consider the action in conjunction with the broader market along with your own stops before considering liquidating part or all of the position. My contention is that “Wood drastically underestimates the impact of…”; sorry about that. Had a Good Will Hunting flashback. No, my contention is that as market darlings the airlines could possibly lead a whole market sell-off, similar to biotech and social media a few months ago. Delta and American are already showing weakness, but especially Delta. My two proprietary indicators gave a buy signal the week of June 30th. I almost never trade without their confirmation, unless I’m going for a quick scalp off the action of the tape. This is a real money move for me and I have already positioned into the short. For you option players, be careful about the core strike of your strategy. For instance, $30 strikes for the September Puts and $35 for the Decembers have a ton of open interest. Things can get a little wonky around those areas so intelligently apply your tactics. Review your Greeks and determine the best course of action for this directional play. Now you can review the CoT’s to assess your prospects for the futures, but for traders of the proxy, this is a handy representation. You can see that when hedgers reach a net long position this tends to be consistent with a bottoming process. As the ETF was only birthed in 2007, the 7 years of data should be statistically insignificant in theory. Relevance is relevance and performance is performance. 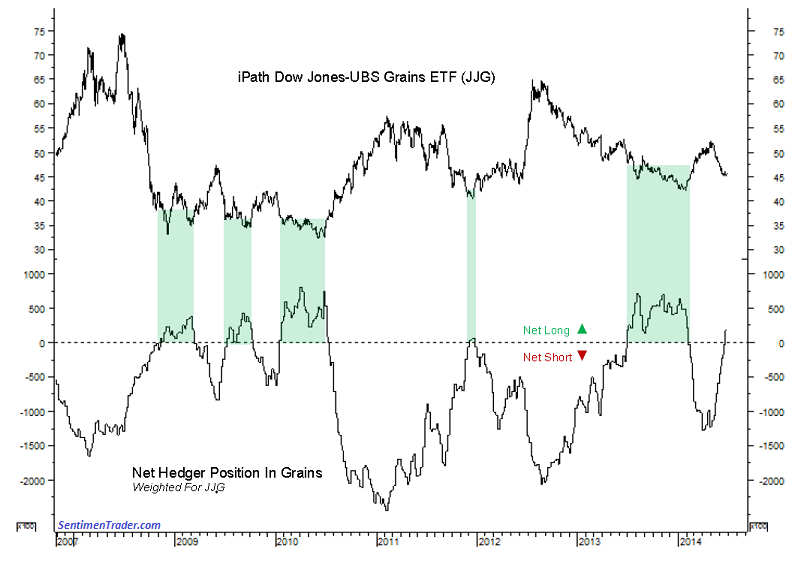 The reason the net long is important is because some of the biggest traders in these markets are the commercial grains producers themselves. Their product sales inherently have them positioned long, so they constantly hedge their sales with short positions. When we see a net long position set-up like what we currently have, then a rally may not be far off. There could be further downside action, but sentiment is so stretched that there may not be much selling energy left. The selloff was so extreme over the last couple of months that I think the snapback will occur soon providing a potentially profitable trade with $44 as the first Fibonacci target. I have not entered a position here. I really like the sentiment and the chance for a contrarian play, but my indicators have not confirmed the move. When they do, I’ll post an update stating that the move is on. For now keep your eyes closely on the grains for a chance to garner profits this summer. 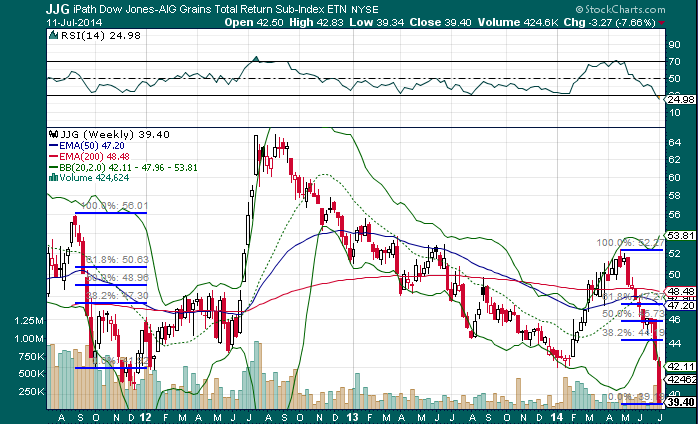 I like your play on JJG and will be watching for confirmation, but not sold on the airlines short. But either way it will be fun watching knowing you have an open position. Keep up the writing. So you’re makrove9m. Was wondering who this lone wolf was that was occasionally “liking” some of my articles. Glad you’re liking the shorter format with a little more trade recommendations.